After Music Festival at Chennai, it is time for the Chennai Book Fair. This time it’s not at Quaid-E-Milleth College at Anna Salai. The Chennai Book Fair 2007 is coming up at St George Anglo Indian Higher Secondary School campus at Poonamallee High Road opposite to Pachaiyappas College. The 30th Chennai Book Fair will be inaugurated by the Chief Minister on January 10, 2007. The office bearers of BAPASI – Book Sellers and Publishers Association of South India are upbeat about this year Chennai Book Fair. 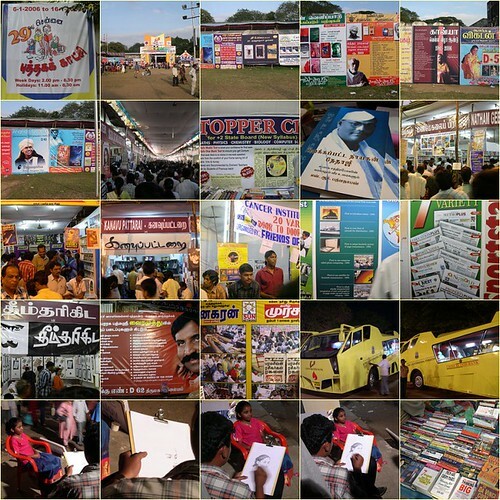 Chennai Book Fair, this year , will be spread over an area of 25 acres, three times the area of the last year’s venue. There could be 410 stalls compared to last years 310 stalls. Last year there were 5 lakh visitors and the organizers expect 12 lakh visitors this year. Chennai Book Fair is rated next to the Delhi and Kolkata Book Fair, at all India level and large no of books are sold. This year, the organizers plan for exhibiting 4.00 lakh titles and the total books on display is expected to be around 400 lakhs. The new location, on a 25-acre campus, has space for the parking of up to 1,000 cars and 5,000 two-wheelers. With regard to the location not being in the heart of city of Madras, the organizers state that half the visitors to the book fair came by car and some 25 per cent by two-wheelers. For those who commuted by public transport the Chetpet and Nungambakkam stations were fairly close. Regular visitors to Chennai Book Fair will agree that the Quaid E Millath College campus was inadequate for the ever increasing book lovers visiting the Book Fair. One can hope that the new venue will make the visit to Chennai Book Fair a refreshing experience for the book lovers of Chennai. The book fair is not like what i used to see 10-15 yrs back. Its mostly stalls with Tamil books. The music season has improve with concerts all over Chennai.This is quite commendable.Ive attended 6-7 concerts this season. My favorites are Yesudass and Kadri Gopalnath.It was bliss at these concerts. I actually went to this place last weekend but was disappointed to note that it only start after 10th. I havent been to these fair for about 14 years, the last time I was there..it was with my dad when I was a young’n. I remember it well, getting black beauty and other classic books. I have been away from chennai for 14 years and now I will be going back to this again hopefully to relish those memories. I hope this year exhibition starts with little delay but facilities will be improve than old venue. I am a regular visitor from 1987. But past 2yrs I am unable to visit. So I am eagerly waiting for the great events. ok .IT IS NICE ..but WHEN THE quiz ? that is the quist al the time . Ok .It is nice to smell (atleast) the new books ..But WHEN THE ‘quiz’ ?